Successfully Added Runbo Q5S Android Rugged Smartphone - 4.5 Inch Display, Quad Core CPU, 1GB RAM, 8GB Internal Memory, Walkie Talkie (Black) to your Shopping Cart. The Runbo Q5 S Android Rugged Smartphone features a 4.5 Inch Display, Quad Core CPU, 1GB RAM, 8GB Internal Memory and a Walkie Talkie function. Just like the 1980s blockbuster Stallone movie ‘Rambo’, this tough smartphone takes a lot of its design influence from the movie. This is the Runbo Q5 S, a rugged phone with a different and is also the successor to the popular Runbo X5. Inside the rugged protective exterior is a quad core processor that can reach speeds of up to 1.2GHz, which is also backed up by 1 GB of RAM to enable a performance that is overall better than the X5+. 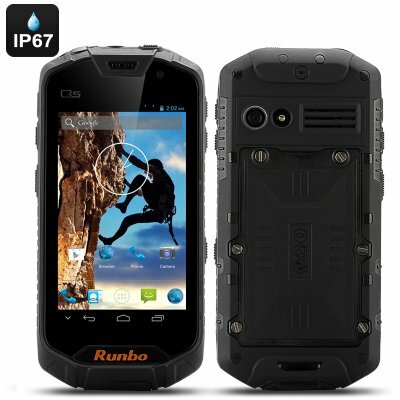 This Runbo phone has been built using high quality materials and combined with a sealed design this phone has an IP67 waterproof and dust proof rating. 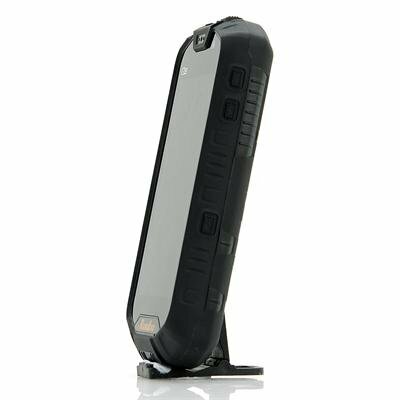 As this phone is protected against dust and water ingress it can withstand whatever Mother Nature can throw at it plus it has been tested for up to 30 minutes against the effect of immersion by being totally submersed in between 15cm and 100 cm of water. Fitting neatly in the palm of your head, the Runbo Q5 S has a practical sized 4.5 inch touch screen display that is highly responsive and provides a resolution of 1280×720, which results in you viewing beautiful images. Not just the phone is tough but the screen is re-enforced with Gorilla Glass technology so it is stronger than the average smartphone screen as well as being more resistant to scratches and damage. Communication is the key function of this phone and it has several ways to achieve this, firstly it comes with not one but two micro SIM card slots and can support GSM and WCDMA bandwidths. If you are out where the phone signal is weak this cleverly designed Android smartphone has the ability to be used as a Walkie Talkie, supporting 400-470 MHz Ultra High Frequencies. Store all your installed apps that you can download from the pre-installed Google Play store or your photos and videos taken with one of the phone’s two built-in cameras on the 8GB of internal memory. This product is in stock now, we guarantee next working day shipping and offer a 12 months warranty on all our products. Brought to you by the leader in electronic devices and wholesale android phone, Chinavasion.